A lively village atmosphere with antiques, delicatessens, cafés, pubs, restaurants, speciality shops and the famous artisan cheese shop, Mellis. Erica's Flat is a modern Edinburgh apartment with a balcony on the first floor (U.S.; 'second floor') reached by stairs or elevator. Stockbridge is on the edge of Edinburgh's New Town (built in Georgian times) and has a lively village atmosphere with famously good pubs, restaurants, specialist food shops and great character. All your daily requirements are just around the corner. To the south the very center of Edinburgh is about 15 minutes walk away, and just to the north is Edinburgh's famous Royal Botanical Gardens, acres and acres of beautiful gardens and parkland with tropical plant hothouses. 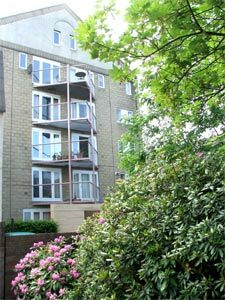 Erica's Flat is ideally suited for 2 or 4 people; 2 sleeping in the bedroom and 2 sleeping on one or two sofa-beds in the Sitting Room. Pamela's Flat is another flat available for rental, but not illustrated here, just 100 meters away around the corner at No. 3 Haugh Street . 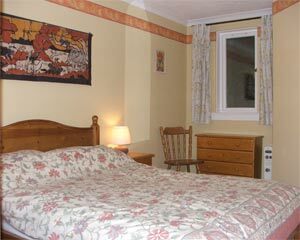 It is of a similar size (sleeping 3 to 4: one double room with a zip and link kingsize bed and a double sofabed in the living room), but has a parking garage on the ground floor. Large bright Sitting Room with French doors to the balcony. At the other end of the sitting room is a dining table. The large sofa bed can sleep 2 people. The kitchen is to the left in the photograph. 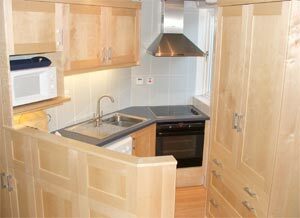 The Kitchen has a fridge-freezer, cooker and washing/drying machine. Both Erica's Flat and Pamela's Flat have a broadband internet connection socket which is free of charge. Next to the bedroom is a bathroom with bath, shower above the bath, basin, wc and shaver point. There are washing and ironing facilities. Hairdryer. Just 100 yards away you can walk along the banks of the Water of Leith, a haven of natural peace which will take you through many secret parts of Edinburgh. 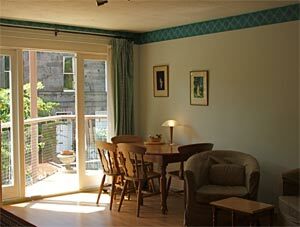 Prices are per apartment for 2 persons occupancy, extra persons £5 per night. Deposit £100 at time of booking, non-returnable. Remainder is payable on entry. Bedlinen, Towels, WIFI, Electricity are included. Parking garage may be available free of charge if requested at time of booking. Low Season: Jan, Feb, Mar, Nov, Dec. Mid Season: April, May, June, Sept, Oct.
Longer off-season lets are available at discounted prices, please ask. Please tell the Hensens you found Erica's Flat through About Scotland!